I’m fascinated by urban farming and it’s potential in the future of food. So naturally, I was excited to visit Dave Henderson at Red’s Quality Acre Farm this past week. The farm is a beautiful 2 acre plot in the heart of Durham that has been operated by him and Caitlin Law for the past 5 years. Upon arrival, Dave offered to give me a tour of his farm. 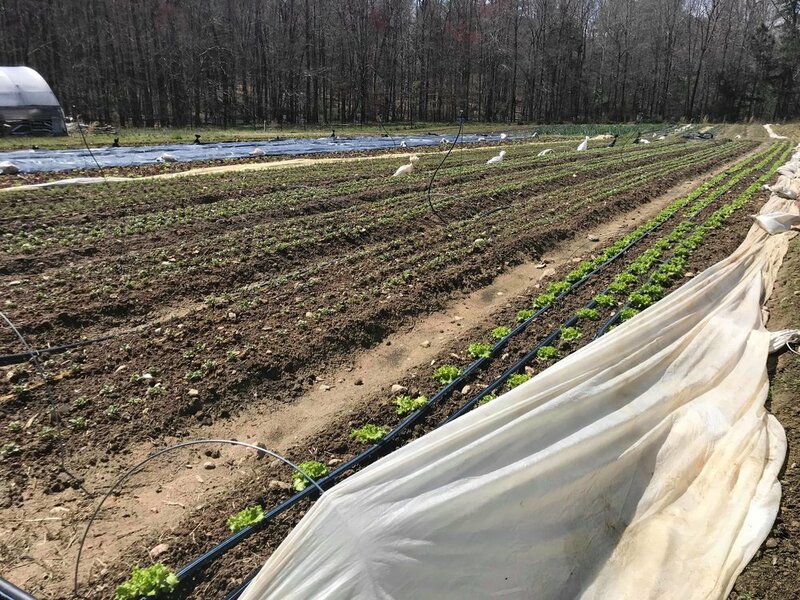 We walked through a mix of open field crops and high tunnels where he had a variety of lettuces, radishes, cilantro, garlic, and some rows set aside for the upcoming strawberry season. The cilantro seedlings, with their ‘cotyledon’ showing. 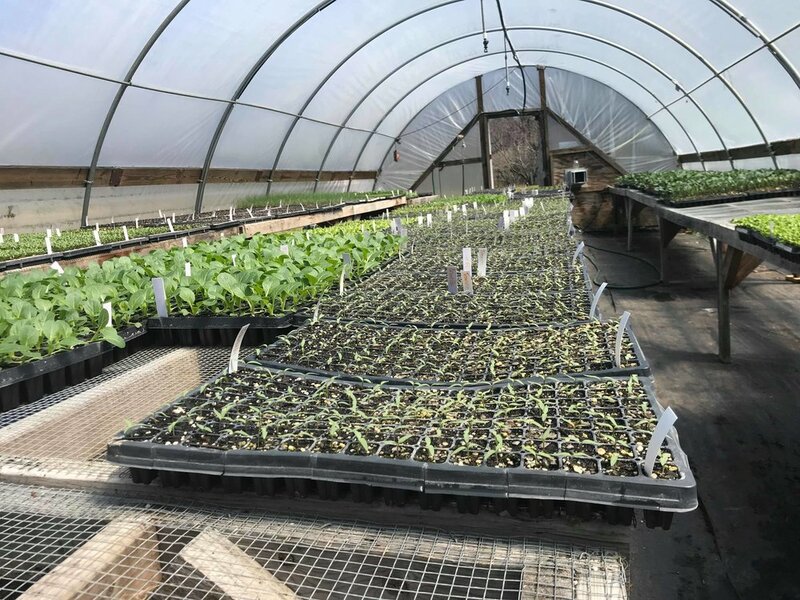 One of his high tunnels housed seedlings that were almost ready to plant. Pictured, you can see the early stages of cilantro plants - Dave explained that the long leaves are the ‘cotyledon’, one of the first leaves to appear from a germinating seed. Dave holding his specialty garlic! I’m in awe of the amount of care he puts into growing his products and it shows in the quality. I can say that because I tried one of his radishes that he pulled straight from the ground, and it was delicious. Freshness and intentional care makes a difference - you’ll know if you try it! Red’s Quality Acre is unique in their ability to grow speciality crops that are hard to find (like the variety of garlic he’s holding in this picture). Dave grows these specialty crops upon request from certain NC restaurants. So, what’s hot this season? Dave’s most excited about the salad mix, but says that their arugula, head lettuce, cilantro, carrots, kale, tomatoes, and eggplants are also top products. Their 2019 CSA sign-ups are now open: http://www.redsqualityacre.com/csa. Sign up in time for strawberry season! You can find Red’s Quality Acre products at some of your favorite Triangle restaurants like Mothers & Son, Pompieri Pizza, Eastcut Sandwich Bar, and Monuts. 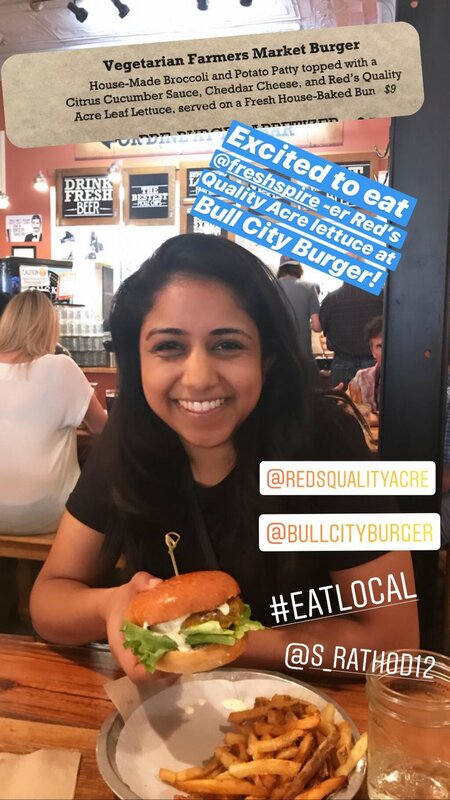 This past weekend, I indulged in a veggie burger with their lettuce at one of my personal favorites, Bull City Burger and Brewery! 5 stars from my end. Best of all, you can purchase their products in the coming weeks from our friends at any of the 3 Weaver Street Market stores! Are you a restaurant or grocery store that would like to source from Red’s Quality Acre? Join Freshspire at freshspire.io.